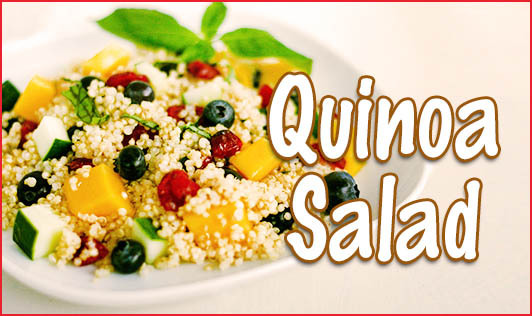 Quinoa is a gluten-free grain which is a good source of protein, fiber, and iron. It cooks like rice and takes about 20 minutes for cooking. Quinoa is available in health stores and supermarkets and has emerged as a super grain due to its high protein and gluten-free status. Below is a recipe which includes this new superfood along with the other healthy vegetables to make a great fiber-rich dish. In a saucepan bring water to a boil. Now add the quinoa along with a pinch of salt. Let it simmer for 15 minutes on low flame until the water is absorbed. Allow it to cool to room temperature. Meanwhile in a large bowl combine the olive oil, salt, lemon juice, tomatoes, cucumber, carrots, and parsley.